into or an idea of the future. I am born and raised in beautiful Vancouver BC. Ive lived here my entire life and would never want to live anywhere else. Growing up I was always a bit wild. I loved singing, dancing, acting and putting on shows for anyone who would watch. Ive always been comfortable in front of a crowd. I loved dressing up in my grandmothers clothing and putting on fashion shows, or "producing" shows with my sister where we would play all our instruments (piano, flute and violin...although neither of us have played in years), and sing songs for anyone who would watch. Well I think it was pretty obvious from the get go that I loved fashion and being the centre of attention. I've always loved fashion, makeup, and putting together outfits. I loved having my picture taken and would seek out the camera to make sure I was in the photo, or asked my parents or grandparents to take photos of me. I am currently working lots, but also make time for my other project, Beauty Mark Magazine. I have always been an advocate for self love, and body positivity. Beauty Mark Magazine is a fashion and beauty magazine that focuses on inner beauty and inclusiveness. It also highlights peoples unique qualities and those features that make them different, as opposed to most mainstream media that focuses on idealistic beauty standards. I also am becoming more involved with speaking out about mental illness stigma. I suffer from depression and anxiety as many do, and I hope to continue speaking to encourage people to reach out and get the help they need, and also realize that they are not alone. I haven't always been so confident. It was a journey. As much as I've always loved being the centre of attention, I was also bullied for my weight (and many other things) growing up. Modelling has helped me become more self aware and confident. Before I was a model, I was a professional chef, preschool teacher, and event planner. I consider myself to be a bit of a "Jane of all trades"
I have been involved with VALT from the very first year! I had just started to take my modelling a bit more seriously and decided to audition. I was so nervous, but I got cast to walk for 3 designers. I have made so many friends and contacts through VALT and have been involved every year since then. I love VALT for its inclusivity. Not only are the designers from all walks of life, but they show fashions that range from wearable to haute couture, to amazing artistic avant guarde. Not only that, but models range from standard to plus size, men, women, LGBTQ, disabled, tattoo, and any other type of model you can think of. Not only that, but VALT also includes art, music, and performances that keep the audience captivated and coming back for more. I love VALT for its inclusive nature in every way possible. The VALT family is one big happy loving family that I am so proud to be apart of. I have SO many. Opening the show for Skye Davies at the second year of VALT was a highlight for me. 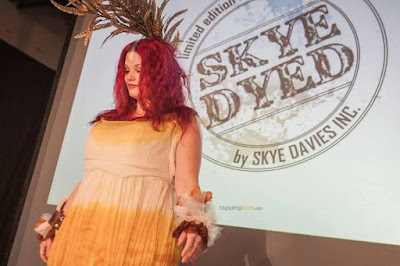 She designed a custom dyed silk gown for me that was STUNNING. Last year my husband (then fiance) and I took in the show from the audience and that was a treat as well to be able to watch the show instead of being back stage. I'm so excited to be hosting this year on Friday and walking in the show on Saturday! How did you end up becoming an emcee for VALT 2016? I got an email from the Kat's in the summer asking if I would be interested, and of course I jumped at the opportunity! I am so excited and grateful for the opportunity. I will be hosting Friday nights "VISION" festivities. I cannot wait. I don't want to give too much away, but I will be portraying an iconic "vision" and encouraging those in attendance to pay attention to not only what they are seeing in front of them, but also what visions might come to them if they broaden their outlook. Stay tuned! Ruby Roxx is a fixture in the Vancouver art and fashion scene. As a plus size model for 8+ years, Ruby has been seen either on the VALT runway or in the audience every year and is thrilled to be hosting VISION for the 5th Anniversary of VALT this November. As well as modelling, Ruby is also Editor in Chief of Beautymark Magazine, a writer, public speaker, and self love activist. She has made waves for standing up to cyber bullies and body shamers, and loves helping women see how beautiful they really are inside AND out. She truly believes it is our differences and unique qualities that make us beautiful, and if we stand together and bring each other up, there's no telling all the things we can be capable of. She is inspired by the unique and wide range of qualities, in the models and fashions of VALT and is excited to help showcase this diverse group in what is sure to be an amazing weekend of creativity and inspiration. Ruby is excited to give you VISIONS this November as she helps you discover everything in store for the Friday showcase of #VALT2016.